You guys. It’s strawberry season! I’ve been shoveling them in my mouth by the handful. They are so good already. But instead of just posting some pictures of some really beautiful strawberries, I decided to make you a crumble. I’m beyond a fan of fruit crumbles. Actually, top anything with an oat-brown sugar-cinnamon topping and I will inhale it. I love the way fruit bakes up and contrasts with the texture of the crumble topping. I literally threw this recipe together for a quick dessert one night. It was so fast and baked while we ate dinner. It’s dairy-free, vegan, gluten-free (with GF oats), and with just a little bit of sugar and oil, it’s fairly healthy. So feel free to eat this for breakfast, lunch, dinner or snack. Or all of the above. Your summer-craving taste buds will thank me. 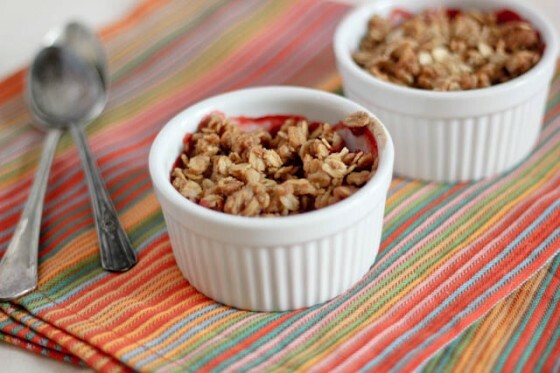 Quick crumble recipe with sweet strawberries and a vegan streusel topping. Preheat oven to 350 degrees. Spray four-1/2 cup ramekins with non-stick cooking spray. In a small bowl, mix the strawberries, lemon juice and 1 tablespoon of flour until blended. Set aside. In a medium bowl, mix oats, the remaining flour, brown sugar, cinnamon and salt together until mixed. In a separate bowl, whisk oil, maple syrup and vanilla. Stream into the oat mixture and stir with a fork until all the liquid is well-incorporated into the dry. Spoon 1/3 cup of the topping ingredients into the strawberry mixture and stir. 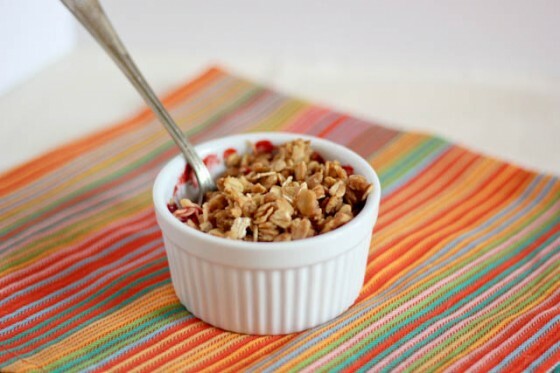 Divide the strawberry mixture evenly among the ramekins and divide the oat mixture evenly on top of the strawberries. Bake in the preheated oven for 25-30 minutes until the strawberries are tender and the topping is golden brown and crisp. Swap out the strawberries for any fruit that you like. A mixture of various berries would be delicious! Gluten-Free Adaptations: use gluten-free oats and a gluten-free flour mix or use half the amount of gluten-free cornstarch in place of the flour. This sounds perfect, and as the season progresses, I can use any fruit. Our blackberries are already close to picking. Pinned this and will be making soon! I hope you enjoy Joan! I have a bunch of fresh strawberries in the fridge right now…this is the perfect way to use them up! 😀 Mmm! So easy! Love this idea! A crumble topping makes everything better! I’ve got to make this. You are so clever! We are a month away from strawberry season up here and it is a fabulous time of year. I eat so many as well. This crumble looks outstanding!! this looks awesome! i am all about the fresh, local strawberries this time of year, too. they are just too delicious! This sounds like a perfect breakfast to me! Love fresh strawberries!! Mmm, I love crumbles sooooo much, and this looks amazing! Gorgeous fresh pictures! Strawberries and individual crumbles are my fave! Totally off topic, but I love your nail polish! Haha! Thank you, lots of people have said that. It’s an OPI polish called Cajun Shrimp. One of my favorites! I love this! It looks so simple and like you said, fairly healthy. 🙂 I think I might try it with raspberries because baked strawberries aren’t my favorite thing. They just shouldn’t be mushy! Mushy frozen raspberries are okay, though. 🙂 The topping looks so yummy! I think it would be amazing with raspberries. I’ve also made it with a frozen mixed berry blend and it was great! Yum! Love crumbles. We make one that is very similar but includes rhubarb. Yep. so making this. Adorable!! I love crumbles too! Looks like the perfect summer dessert! anything with a crumble topping and I am sold! love it! So does this work with a GF flour blend? The writeup mentions this is gluten-free, but there is flour in the ingredients. If you mean GF flour blend, will that adequately thicken the strawberry mixture or will I have to substitute some cornstarch in there instead? Hi Eric, oops! I just realized that I hadn’t added the adaptations. I have tried it both ways and GF flour blend works but cornstarch works better, just use half of the amount of flour in place of the cornstarch. Thanks for bringing this up! i love the sound of this! simple berry desserts are my fave! Anything with “crumble” or “crisp” or “streusel” has my name written all over it! And I just bought a HUGE carton of strawbs at the market. Love this Cassie! I love crumble! I would be whipping this up for dessert every night if I could! I love that its strawberry season too! I could eat this all day long! So summery and refreshing! Yum! Anything with a crumb topping is a good thing! So perfect! I love strawberry season, it’s like christmas! This looks so good! And the pictures are beautiful! This sounds delicious! I can’t wait to try! If I don’t have grapeseed oil, could I use canola? Also, would a 8×8 glass baking pan work in place of ramekins? Hi Angela, yes, canola is a great sub for grapeseed oil. And if you use an 8×8 dish, I would double the recipe just to make sure that it’s not too thin. Hope you enjoy! you know I love crumbles 😉 anything with that crumb topping, I’m all over — especially in ramekins!! these look great, cassie! i love that they were impromptu too! I couldn’t agree with you more – put a crumble topping on anything and it instantly makes it about 100x better 🙂 I have a ton of strawberries in my fridge so I just might need to whip this up one night soon! I love strawberries too! And crumbles!! Perfect dessert for this time of year! The smell of a crumble baking is just heavenly! Seriously, I’ve been non-stop eating market fresh strawberries all week. 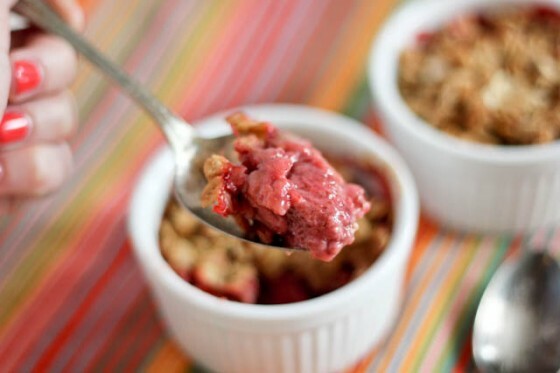 But this crumble – I want it for breakfast right now… which is weird since it’s 12:27 am. Maybe I can convince the man to make it tomorrow – here’s to hoping! Who doesn’t love a good crumble! This looks marvelous. Strawberries are crazy expensive here, so they are a big treat when we get them. This would be a great way to use them though! I agree, crumbles are the best. They are so much easier than pie, and the topping is to die for. I’ve never thought about using grapeseed oil, but it sounds likea great idea! These photos are gorgeous and a lovely recipe too. Healthy and seasonal, which I just love. I ADORE strawberries in any baked goods, so this has definitely made its way to the top of my dessert rotation. I whipped this up for our dessert last night, and like you said, it baked while we ate dinner. Perfect! I made it with a combination of strawberries and blueberries. It was really easy to halve the recipe for just two servings, and I found the recipe to be perfectly, not overly, sweet. Thanks for commenting Lizzie! I am so glad you enjoyed it, and glad to hear that you added blueberries! This is one of my all time favorites. Looks amazing! Yes, please do! I would love that!! I love how quick and easy crumbles and crisps are to throw together! This looks delicious Cassie! May I ask you which “Share” widget you use that pops up at the bottom of each post? Thanks and have a lovely long weekend! I love how quick and easy crumbles and crisps are to throw together! This looks delicious Cassie! May I ask you which “Share” plugin you use that pops up at the bottom of each post? Thanks and have a lovely long weekend! OOOhh… I love any type of fruit crumble or crisp. Looks great Cassie! The strawberries get really good here in June – I can’t wait! And I love a good crumble! This looks so good, Cassie! Where in KC are you finding good strawberries? I still have yet to get some really great ones!